What a lovely little road Strapazza's is on in Towson. The trees are lit up with Christmas lights, there are plenty of outdoor seating, and suddenly Towson is sweet and charming. If you come to Strapazza's for some hearty and authentic Italian food guess what? You will NOT be disappointed. The food here is filling, plentiful and best of all AFFORDABLE. IT'S A MIRACLE! I ordered the tortellini bolognese - tri-colored tortellini filled with parmesan and topped with a creamy bolognese sauce. This was amazing. VERY rich and hearty, and enough that you could either share - or take for lunch. 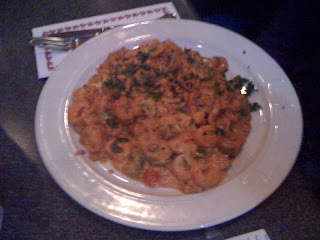 Dan ordered the gnocchi with a tomato, mozzarella and basil sauce (shown below). 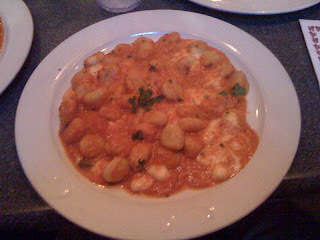 The gnocchi was soft and had just the right amount of chewiness. I loved them, those perfect little potato balls. The sauce was great because of the yummy cheesy balls melted throughout. For dessert they offer a bunch of frozen options (the exact same menu from Pasta Blitz actually), as well as homemade tiramisu and cannoli. I asked our server if these were made in-house, but he just replied homemade.....I'm thinking that they are not made in house. That being said, the tiramisu was delish! Very very very creamy and decadent. The cannoli was good - I liked the cream better than the pastry, which left a weird cardboard-y taste in my mouth which I could taste hours later. Hm. Gross. Get the tiramisu. Overall, I am more than excited to have a neighborhood Italian restaurant which I can't wait to support. And thankfully, because of their prices, AND because they are one of the restaurants on restaurant.com (which is currently taking 70% off their gift certificates until Sunday if you use the code PUMPKIN)- I can!